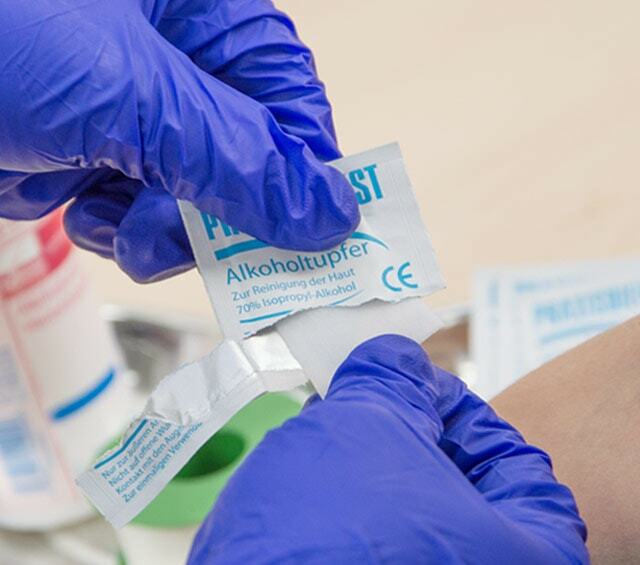 Alcohol wipes are great for disinfecting smaller areas of skin prior to punctures, injections or blood drawing in the general practice, hospital or emergency services. 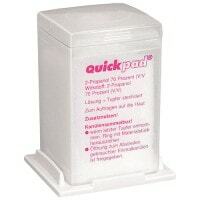 You can purchase these practical, ready to use wipes for great prices at Praxisdienst. Alcohol wipes, also known as alcohol swabs, are excellent for disinfecting small areas of skin prior to injections, punctures and blood drawing. The 70% isopropanol soaked wipes are made of non-linting, non-abrasive non-woven material. This is especially important so that no lint or fibres remain on the skin which could work their way into the injection wound. Disinfecting skin with alcohol swabs is particularly quick - a single swish usually does the trick. 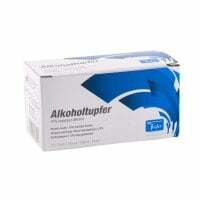 Once the alcohol has been given a chance to take effect, the injection can proceed as usual. Alcohol wipes are usually individually sealed, although there are closable dispensers available from which individual alcohol wipes can be removed. The individually packed alcohol wipes are excellent for filling house call and emergency cases. In our online shop, you will also find diverse disinfectants for every need.